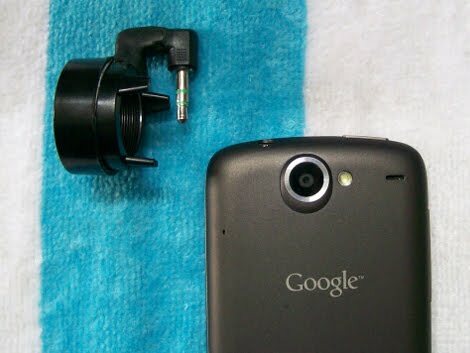 [Thomas] tipped us off about a macro lens attachment for his Nexus One. As you’d expect, adding the lens helps the phone’s camera bring tiny details into focus. He re-purposed a lens from a pair of mini binoculars, using epoxy putty to make a mounting bracket. Now the last time we saw this putty used with a phone it was for a snap-in bracket that cradled the phone and included a lens adapter. Rather than go that route [Thomas] made use of the headphone jack just above the camera lens. An old headphone plug has been epoxied to the macro lens ring, holding it in place securely while remaining easily removable. He could use the headphone plug for data transfer and adjust the properties of the lens, like some tiny motor or something. @zool I think having the phone focus on something that close is kinda what macro photos are about for a phone, it is not supposed to be super magnifying. But I agree that the placement is quite bad as indeed you can see the black ring on the left side. Using the Headphone jack is smart but what about phones that have the jack ina different location? It’s odd that the phone manufacturers didn’t start putting some sprocket of sorts on phones near the lens yet to add such attachments. Whatnot: You might have a billion-dollar idea there. Get on it! This is a great idea, and a very well engineered prototype. The only thing I would add is rubber feet, and a screw-type attachment for the lens for fine focus. Nice hack idea, but it seems that the “macro” capability just shifts the FOV closer to the camera and actually makes it smaller. Not exactly what I’d want from my camera, but if you *really* need your phone to photograph ram, then I guess it’s great.